Welcome to the Sunday update! First on the agenda is to say hi to Mike Thorpe, our newest follower! 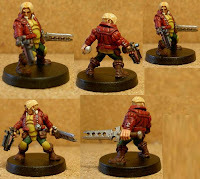 Mike (also known as Carcharoth) is responsible for sending me ten of the fantastic Fubarnii knights that have appeared on this blog. He is also starting up a new venture with Hasslefree miniatures called 'Twilight'. It is a fantasy game that will have a host of miniatures to buy and game with. They are nearly ready for release and as soon as they are available, I'll be posting some details! Welcome aboard our humble blog Mike! Obviously the two minis are very much work-in-progress but you can see the general direction they are going in. The robot still needs his thighs, hands and chest finishing but he is very much along the same lines as the Beetlebots that have been on the Blog before. Inso has plans to build a smaller robot to help with menial tasks and has mentioned R2-D2 as a guide for what he will be aiming at (but he has strictly ruled out a direct copy). As everyone who reads this blog on a regular basis will know, tonight is bingo night and Inso will be disappearing in a short while to call out the numbers...even though he really can't be bothered! That means, no more progress tonight. In his own words, he has gone for dull, bright colours...whatever that means. The Captain has been converted from a Pirate Kjaran with the legs from a Grymn heavy called Knut (both from Hasslefree miniatures) and the addition of some armour plates using some Green Stuff. Again, the base has been left black because Inso hasn't decided what to do with it yet. So...we now have a Captain, a Sensai, 2 Novices with a starship on the way through the post. The only two character miniatures that are left are the warrior and the pilot/tech/cool chick miniature...that is of course, until the Mystic Panda gets released. With the size of the imminent starship arrival, the option to expand the crew a small amount has surfaced. The current crew is made up of the six character miniatures with six boarding party soldiers. The Mystic Panda is going to join as well but Inso has mentioned that there may be space for a couple of robots/androids (especially seeing as they don't need cabin space...they can re-charge in the hold). He still has six plastic Necrons (from Games Workshop) so they may be used for a couple of conversions...alternatively, he may just sculpt a couple. what? Two in one day? The Captain is now on the painting table instead of Jen, now. I guess having the starship in the bag has stimulated Inso's enthusiasm. Gibberish, that's what I'd call it! I had a rather odd chat with Inso today...he obviously hasn't been sleeping too well lately because he couldn't pronounce some of the words properly (and had to be asked to repeat what he was saying numerous times). I eventually got the gist of what he was saying but some of it didn't make much sense. Inso has been buying things from E-bay again and that is what he was telling me about. First up, he's gone and bought ANOTHER Tiger APC. It is another new and boxed one and that brings his total to 6 now (or it will when it arrives). On a different note, he said he had won something else that cures the whole Starship problem for his little Grymn Starship Crew project. All he would say apart from that is that it is big is that it isn't resin and comes ready assembled. 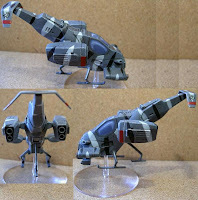 I tried to prize a bit more info from him but all he would say is that it was perfect for his needs and will look great with a few little conversions and all painted up in spaceship colours (whatever they may be). Apart from a bit of online shopping, not a lot has been going on because Inso has had an 'interesting' week at work and by the time he has got home, he really hasn't had the enthusiasm for anything apart from tea, food and bed. On his table are the two Golgo sculpts, 12 Tyranids (in various states of paint) and the little girl Mystic from his starship crew. It is a beautiful evening in Inso's World. The sun is shining, his children are outside playing, he isn't at work until tomorrow and he has a nice cup of tea to drink...what could be better? Inso has kept the scheme simple so as to emphasise the 'monastic' idea behind her and her little novices (the two blade wielding children). Think of her as a martial arts expert without compare who trains her novices in all sorts of combat, diet, mental skills and chi-power manipulation to turn them into wise and utterly devastating fighting machines. Who needs Jedi powers when you can already break stone with your bare hands? I really can't say what will come next but I guess that Inso has burnt himself out for a short while on the Tyranid front...maybe? Yes, it is Sunday again and that generally means an update. This Sunday is no exception and although things haven't gone as quickly as he would have hoped, Inso has sent over a few pix of his Tyranid progress. Inso has mentioned that the 8 Gaunts in the last pic are made up of standard Termagant bodies with Genestealer Scything Talons added. From the beginning, he has wanted to keep his Tyranid horde more 'natural' than the norm (for Tyranids) so he has no ranged weaponry and all of his Tyranids have claws instead. The idea behind it being that a few Tyranid organisms got stranded on a planet, left for millenia and evolved to become an indiginous species...a bit like the bugs in Starship Troopers. Well, it is bingo tonight so I doubt if there will be more painting done but tomorrow is a bank holiday so Inso will have time to get a little bit further. Saturday and the Horde is Taking Shape! First of all, I'd like to welcome the latest follower of our humble blog; Bandit86. He has a blog as well and it is well worth taking a look (especially because it has Grymn in it). Welcome aboard! Inso seems to have been fairly busy and has managed to get all of his 20 Gaunts to this standard. They have been undercoated, base coated with Bubonic Brown and washed with Ogryn Flesh wash. The next phase is for the plates to be highlighted. Then it will be teeth and eyes, bases and varnish...and they will be finished. These are not the only Tyranids in the box...there are three Warriors and a Carnifex with an additional plethora of Rippers but Inso is concentrating on getting the Gaunts finished at the moment. As you can probably tell, they are only going to be tabletop quality and have had a scheme chosen that will enable them to be painted quickly but to a fairly acceptable level. There are a few interesting sculpts on the workbench and Inso is looking forward to a few...especially all the Grymn and little Megan in powered armour. Well, that is about it for today. Well, it is Tuesday and there seems to have been some activity in the followers section so I'd like to welcome MrTeufel and Jenova Painting to our humble blog. Why Tuesday TERROR? Well I happened to spy Inso's painting table today and aside from the 5 Genetic Infantry and two WIP greens, there were TYRANIDS! BUT...he painted the test Gaunt above before he got hold of the new Games Workshop washes so he has mentioned that there may be a slight difference in the shading because he'll be using the washes instead of watering down the standard paints. Currently, Inso has 8 Gaunts on the table. 4 are undercoated in Deneb Stone and 4 are base coated in Bubonic Brown (which is a mustard yellow...for some reason?!?). All I can say is that there are some really strange things going on inside Inso's head! Sunday morning and an early update. 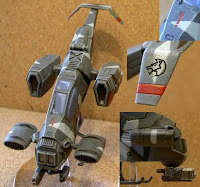 This particular VTOL is from Wolf Squadron and is the red section leader. In the last pic there is a Grymn to show you how big the VTOL is when up against the troops it is meant for. 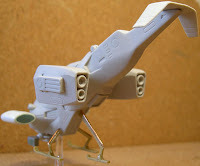 The VTOL still needs varnish but is complete apart from that. Saturday and it smells like...victory! 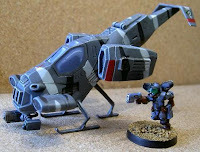 This is the Grymn Attack Copter that Inso was Kindly sent by Sally and Kev from Hasslefree Miniatures. 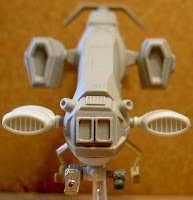 He has added some undercarriage, a chin weapon and a pair of speakers. This is a sort of homage towards one of his favourite films 'Apocalypse Now'. In the film, a squadron of helicopters fly towards a small settlement, start up the 'The Ride of the Valkyries' on the stereo and start blasting...it is very inspiring. I've been talking to a rather tired Inso today. Work has been very busy and although he is very happy about it and enjoying the change, he is feeling the effort...poor little chap! That said, he has still had a bit of time in the evenings to potter about with his hobby. 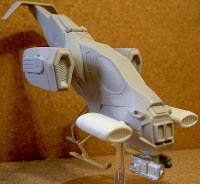 This weekend, Inso is planning to build some undercarriage, weaponry and a pair of speakers to customise it as the lead copter in a future squadron. In the mean time, he has been putting together his next squad of Genetic Infantry. So far, he has cleaned, based and undercoated 5 of the Vasa marines and they are much the same as the last two squads. He hasn't got too far; he has just base coated and washed the skin, ready for the highlights...but it is a start. Well, that's the week so far. Whether there will be much of an update at the weekend, I can't say...hopefully, we'll see some results of his copter customisation. In the box above, we have 2 light infantry platoons (24 troops in each), a heavy infantry unit (16 troops), a support platoon (16 troops) and a Kindred sniper unit (12 troops). So...why has he been looking through his army box? Well...he now has £150-00 to spend at Hasslefree Miniatures, thanks to a great deal over at their site. That has meant that he has been thinking about what is needed to finish off the troops for his Urban army. Obviously, he'll need a command platoon but he has some other issues about his army. First of all, the light infantry squads only have flamers for support so he wants to swap them with some grenade launchers and plasma rifles. Secondly, he needs to add a couple of standard troops to finish off one or two of the fire teams (as they are a couple short). Finally, he needs to make a decision about what sort of heavy support he'll be taking. Will he go for more support platoons or tanks or even fliers? With so much money to spend, it may take a while to come to a proper decision BUT with a few new releases, I expect that time will suddenly be less of an issue! If the worse comes to the worse, there are a few Hasslefree adventurers that would make great Genetic Infantry, so I don't think actually spending the money will be a problem. It is bingo night again so the hobby will take a break for the evening. I doubt very much if there will be any updates until next Sunday as Inso has a busy week at work so I hope to see you then. It has been an interesting week this week. Inso has been working very hard fixing aircraft and doing all his other jobs at work and has been doing a little bit of over time. That said, he has still managed to work on a second squad of Genetic Infantry and has taken them from bare metal to almost painted. They seem to be calling him to extra endeavor...well, let's face it...something had to! On the delivery front, Inso has received his mint Tiger APC and is very happy with it. He has also had a small packet of specially ordered Lego components. They are mostly wheels but there are a few other bits and pieces as well. He has basically said that they will be for a few small vehicles to act as scouts for his desert Grymn. He has enough components for 8 vehicles and if they work out alright then he is keen to get more Lego to make a platoon of them. I guess that they will be trikes of some sort because he has 24 wheels...but whether they will be side cars, choppers or all in line I've no idea. They may just be bikes with a spare wheel! As you can gather, he isn't sending pix of the bits and pieces so I guess he wants to keep us a little in suspense. 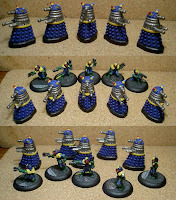 I think that there will be pix of finished Genetic Infantry by Sunday evening though. What will be next? Well I honestly couldn't say. I saw Inso looking at a box of Perry Miniatures plastic American Civil War minis a little while ago today...so your guess is as good as mine! I would probably expect him to start the next squad of GIs, get bored half way through and then finish off his 3 half painted starship crew...or maybe crack on with his little Grymn vehicle project when the wheels and stuff turn up from Lego. I'd really love to be able to show you lots of pix tonight...but none have appeared so I can't. Inso has had a family day and has been busy shopping and watching DVDs. Fortunately, before all the normal stuff went on, Inso got up bright and early, left his family to their sleep and did a spot of painting. He reckons that tomorrow he'll have the first of his Genetic Infantry squads painted (but not based)...all he needs to do is highlight 5 pairs of trousers and finish off their weapons and he's done. Hopefully, we'll see some pix tomorrow. On to other things...Codex Imperial Guard. Inso has had a bit of a read and has decided that although the doctrine system from the old codex has gone, there are plenty of positives to be found. First up, you can now field armoured cavalry as the infantry platoon squads can all now have Chimeras. There are a few new squads: penal legionaries and psyker squads. There are veteran options to allow you to give your veterans (now a troop choice) Grenadiers or other disciplines (they allow them to take special equipment or skills). Tanks, Valkyries and Sentinels are now all taken in squadrons of 1 to 3 (so you can have 3 for one Heavy Support/Fast attack choice). Lots of other good things are in there as well...so all in all, the Codex is a change for the better (except for the lack of the Carapace armour doctrine :( ... As far as Inso is concerned, he'll just pay a few extra points and give all his Grymn carapace armour anyway! He doesn't game so he doesn't really care that much about the letter of the laws...although the framework helps him to set limits on his armies). So...tomorrow...finished squad of Genetic Infantry. Click the Pic for a better view and a few labels! As yet, there is no sign of the Tiger APC but it has only been a few days so there is no need to worry too much about it at the moment. Back to the pic and this little lot cost Inso the princely sum of £7-70...including postage! I asked Inso why he had bid on them and he replied..."why not?" whilst looking at me with a rather bemused glance. He did say that it was worth a punt as he could always use extra troops for his genetic infantry project and this pack had the marines with the extra bonus of a couple of rather nice bikes as well...not bad at all for the price! On to different news, Inso went to a Games Workshop store today and came out with the new Codex Imperial Guard and a pack of 5 Ratling snipers. He has browsed the rules but doesn't have much to say about them at the moment apart from..."there goes my Grymn carapace armour". He really liked the new Ratling snipers though...even if the first thing he said about them was..."I'll need to put boots on two of them". He really isn't keen on bare feet in the 40th millenium! Well, it is a beautiful day and Inso is planning on a bit of lawn cutting so I can't say whether anything will be forthcoming from a hobby perspective today. I guess we'll just have to wait and see!